A Data Entry Specialist is regarded as the link between computer data and paper information. 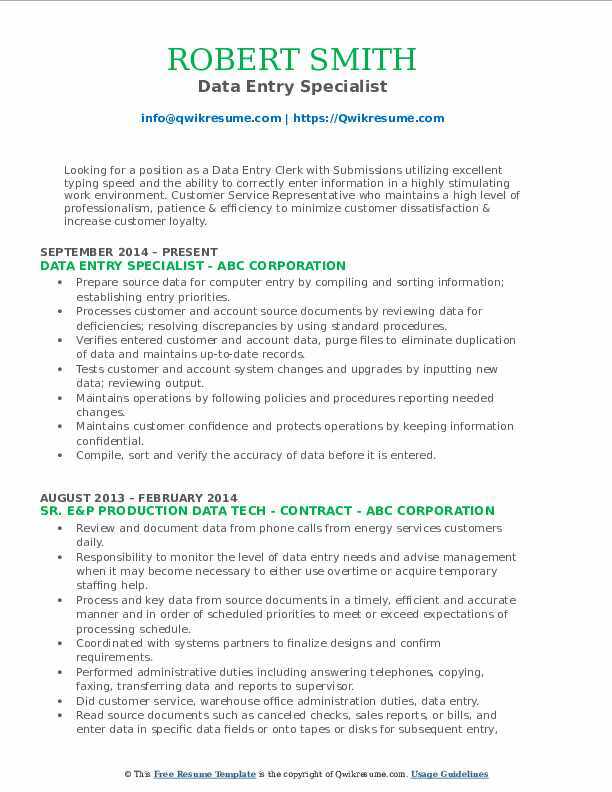 The job description includes taking information from various locations and entering such information into an electronic data system for analyzing and storing purposes. 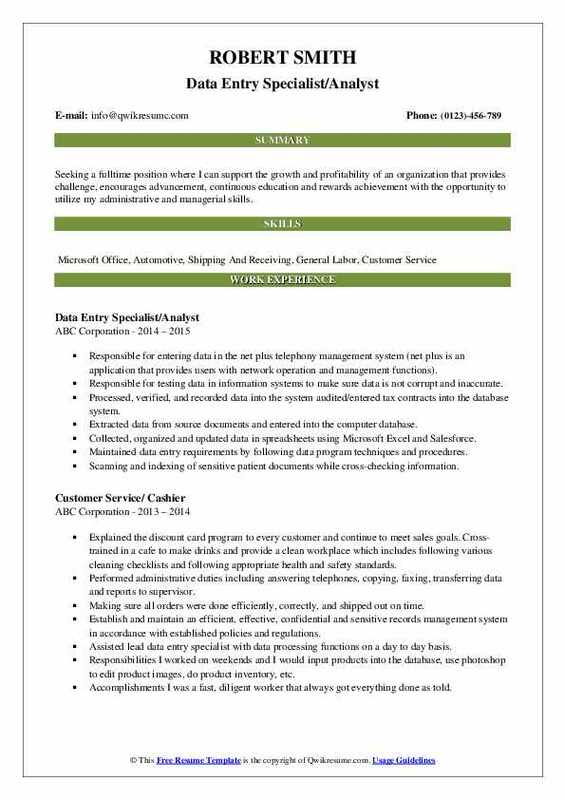 To execute this core task, the Data Entry Specialist Resume mentions the following associated tasks – prioritizing and batching materials for data entry; inputting information into systems accurately, taking customer orders and entering them into tracking systems; ensuring the received information is correct, making necessary corrections, entering the data, and storing such data as hard copies or electronic data. 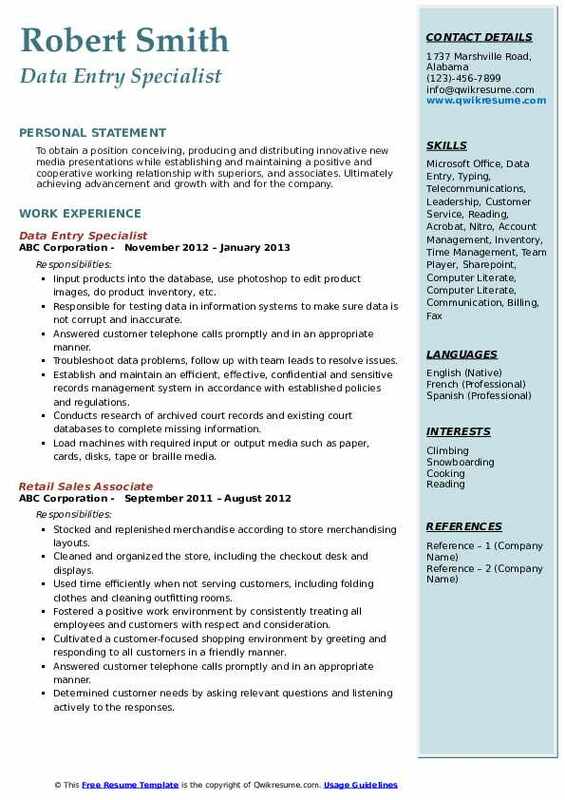 The job resume should include – fast and accurate typing skills, proficiency in MS Office and other relevant software applications, ability to input high volume of data, knowledge of spellings and grammar; and accurate keyboard skills. One can get started as a data entry specialist with a high school diploma or GED; but it is also necessary to have a formal data entry training or system-specific training. Summary : Seeking to combine operations and research experience to enhance work environment. Over five years experience as Administrative Assistant and over ten years providing excellent customer service and data entry/payment processing in highly sensitive, crucial deadline environments. Created, implemented, and oversaw events, programs, and services to meet the needs of a diverse student population. Provided an extended learning environment through programs, services and personal interactions for students holistic journey. Direct and coordinated the graduation ceremony and yearbook publication. Networked with businesses on behalf of the students to gain support and work-based learning opportunities. Maintain detailed work base learning records and logs of students, parents and business partners via the, etc on-line program. Oversee and create opportunities for etc students to explore work-based learning and post-secondary experiences. Prepared and maintained payroll information on all student and supervisors via on-line cps operations center. Objective : Seeking a fulltime position where I can support the growth and profitability of an organization that provides challenge, encourages advancement, continuous education and rewards achievement with the opportunity to utilize my administrative and managerial skills. Responsible for entering data in the net plus telephony management system (net plus is an application that provides users with network operation and management functions). Responsible for testing data in information systems to make sure data is not corrupt and inaccurate. Processed, verified, and recorded data into the system audited/entered tax contracts into the database system. Extracted data from source documents and entered into the computer database. Collected, organized and updated data in spreadsheets using Microsoft Excel and Salesforce. Scanning and indexing of sensitive patient documents while cross-checking information. 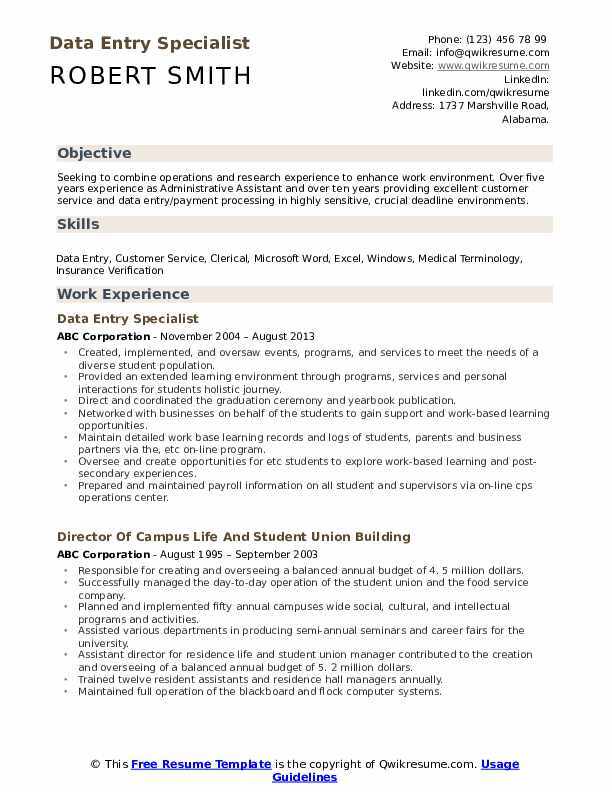 Summary : I am seeking full time employment where I can be challenged in my environment and help grow and serve the company to its full potential. I am great at multi-tasking, paying close attention to details, working as a team player or independently, and communicating effectively. Provided support for meetings and conferences, including appointments, and correspondence. Provided other general office support as needed, such as sending faxes, running errands and making deliveries outside the office building. Performed miscellaneous data entry or another simple, clerical work to assist office personnel, as needed. Maintained supplies in stock and well organized in copy rooms, supply rooms, conference rooms, and coffee stations. Screened telephone calls, personally responding to routine requests for information and directing other calls to proper office or personnel. Read and routes incoming mail and distributes reports and other mailings. Performed other duties as a supervisor from time to time as deemed necessary. Objective : To obtain a position conceiving, producing and distributing innovative new media presentations while establishing and maintaining a positive and cooperative working relationship with superiors, and associates. Ultimately achieving advancement and growth with and for the company. Iinput products into the database, use photoshop to edit product images, do product inventory, etc. Troubleshoot data problems, follow up with team leads to resolve issues. Establish and maintain an efficient, effective, confidential and sensitive records management system in accordance with established policies and regulations. Conducts research of archived court records and existing court databases to complete missing information. Summary : Dedicated Customer Service Representative motivated to maintain customer satisfaction and contribute to company success. Highly enthusiastic customer service professional with 8 years of client experience. Energetic with strong time management skills who thrives in a fast-paced, dynamic environment. 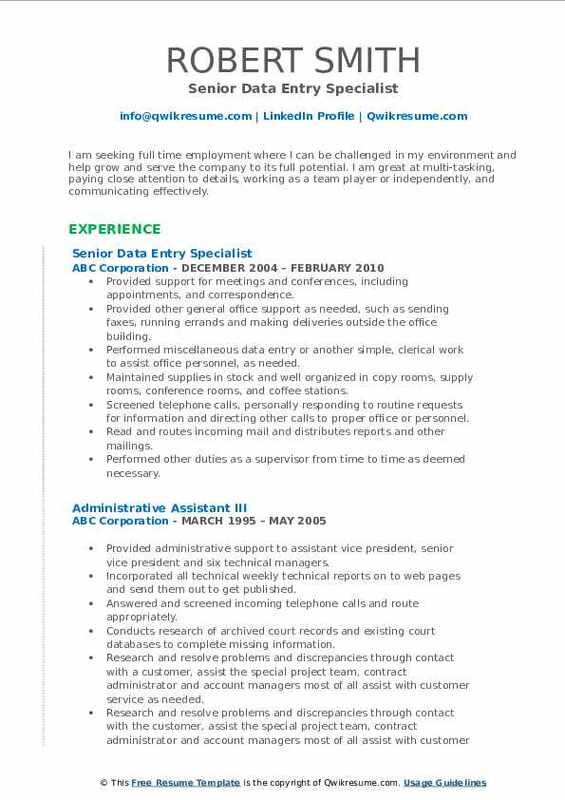 Skills : Administrative Strategies, Data Entry Keying, MS Office Proficient, Lotus Notes, MS Outlook, Advance Knowledge Of Office Equipment. Receiving, processing, investigating, and resolving customer disputes, fraud cases, and legal compliance issues. Report and reconciliation of disputes as well as minimizing risk and loss. Provided accurate and appropriate information in response to customer and property manager inquiries. Promptly responded to general inquiries from members, staff, and clients via mail, e-mail, and fax. Assisted lead data entry specialist with data processing functions on a day to day basis. Performed administrative duties including answering telephones, copying, faxing, transferring data and reports to supervisor. Resolved discrepancies by using standard procedures or returning incomplete documents to the team leader for resolution. 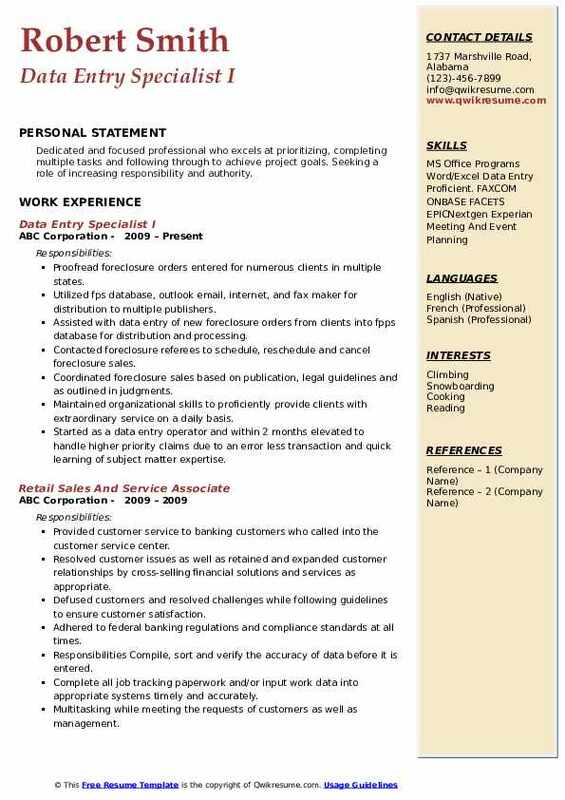 Headline : Looking for a position as a Data Entry Clerk with Submissions utilizing excellent typing speed and the ability to correctly enter information in a highly stimulating work environment. Customer Service Representative who maintains a high level of professionalism, patience & efficiency to minimize customer dissatisfaction & increase customer loyalty. Verifies entered customer and account data, purge files to eliminate duplication of data and maintains up-to-date records. 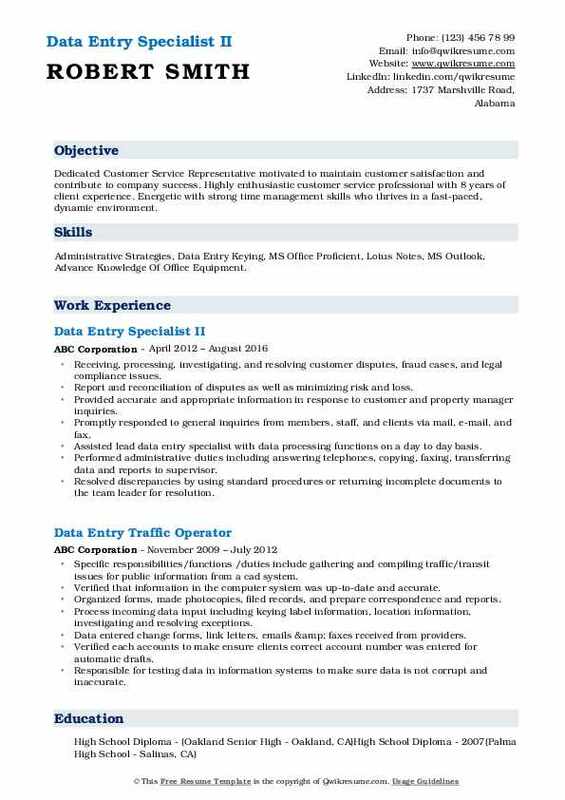 Summary : Dedicated customer service rep/ data entry specialist with motivation to maintain customer satisfaction and contribute to company success. Organized and efficient data entry highly skilled in office administration, data organization, proofreading, database management and word processing. Compose letters and other correspondence to customers inquiring about how to obtain a lower rate, incorrect billing enrollments, and other issues. Process enrollments dealing with a request for gas and electric rates and terms. Deliver completed documents to agents so they can get them inserted into envelopes to be mailed. Retrieving loan documents, including deeds of trust, promissory notes and assignments of mortgage. Data entry, verification, and research of client account for payments to proper cases. Received files from me advantage - had to update credentials, add effective date & added tracking. Summary : Dedicated and focused professional who excels at prioritizing, completing multiple tasks and following through to achieve project goals. Seeking a role of increasing responsibility and authority. Proofread foreclosure orders entered for numerous clients in multiple states. Utilized fps database, outlook email, internet, and fax maker for distribution to multiple publishers. Assisted with data entry of new foreclosure orders from clients into fpps database for distribution and processing. Contacted foreclosure referees to schedule, reschedule and cancel foreclosure sales. Coordinated foreclosure sales based on publication, legal guidelines and as outlined in judgments. Maintained organizational skills to proficiently provide clients with extraordinary service on a daily basis. 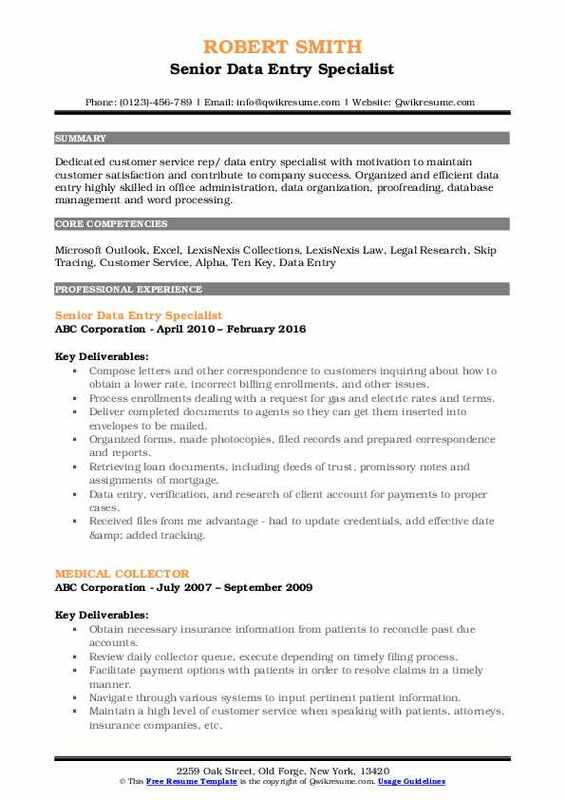 Started as a data entry operator and within 2 months elevated to handle higher priority claims due to an error less transaction and quick learning of subject matter expertise. 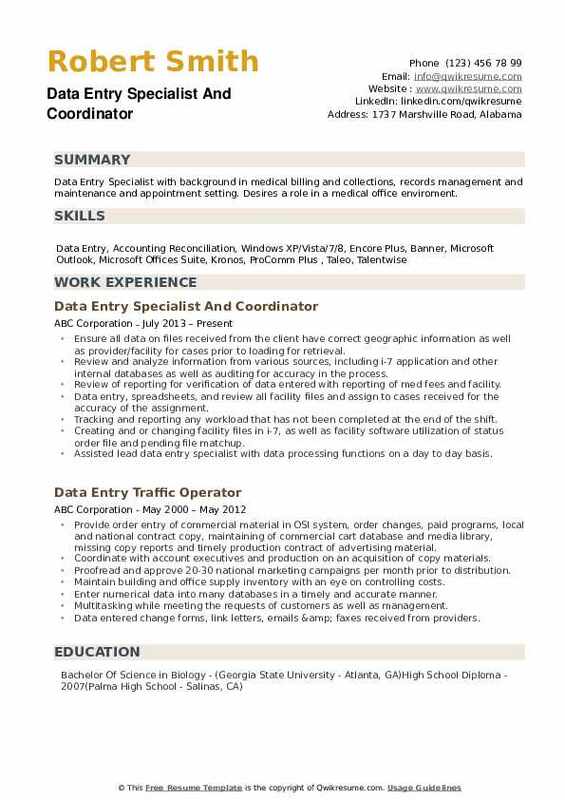 Summary : Data Entry Specialist with background in medical billing and collections, records management and maintenance and appointment setting. Desires a role in a medical office enviroment. Ensure all data on files received from the client have correct geographic information as well as provider/facility for cases prior to loading for retrieval. Review and analyze information from various sources, including i-7 application and other internal databases as well as auditing for accuracy in the process. Review of reporting for verification of data entered with reporting of med fees and facility. Data entry, spreadsheets, and review all facility files and assign to cases received for the accuracy of the assignment. Tracking and reporting any workload that has not been completed at the end of the shift. Creating and or changing facility files in i-7, as well as facility software utilization of status order file and pending file matchup.